Thanksgiving is right around the corner and for many people trying to watch their weight it holds an air of excitement as well as anxiety. This meal, out of all the meals in a year, is the one that has all of mom’s best recipes – the ones that conjure up childhood memories. It is not, however, the last supper. The second purpose is that it allows another meal in the same day where all the foods not tried at the first meal can be eaten at the evening meal. So, all the foods at the table do not have to be eaten at once. Another thing to keep in mind is that the first bite that hits the tongue is the most powerful – it is what sends a ‘zing’ of sensation to the brain. Most people eat so fast that it bypasses the tongue so the brain never gets its pleasure. So make the first bite count – choose a favorite food and then let it linger on the tongue just a moment so the brain has time to recognize it. Put the fork down between bites and aim to make that one plate last 20 minutes – that is how long it takes for your brain to acknowledge fullness. If you eat fast, it is possible to eat double the amount you actually need before that 20 minutes is up. So, take it slow. The final tip is to avoid placing the food to be served on the table. We want what we see, so put it on a counter out of site and it may just save almost 500 additional calories. 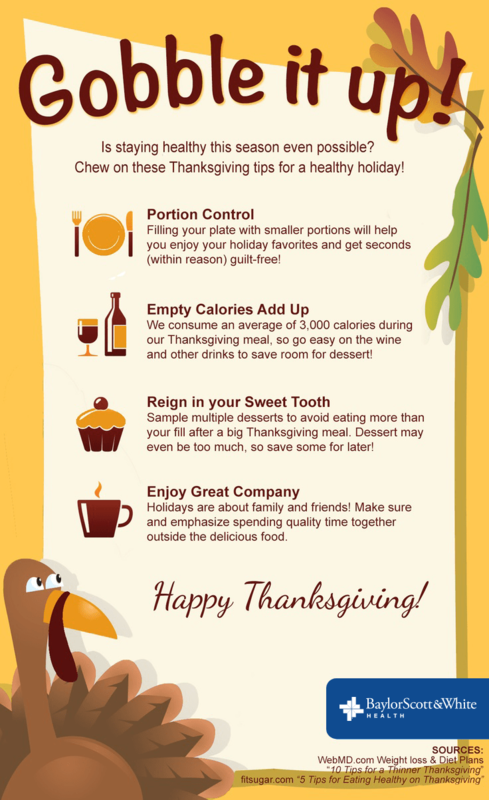 Remember these tips and it can help you keep the excitement and relieve the anxiety about holiday food and added pounds. Previous Previous post: How should you talk to your kids about the Paris attacks?